I have recently returned to work from a year’s parental leave and while I am very pleased to be back, my mind is still often occupied by all things ‘baby’. During one of my more recent 4am night feeds, I thought now would be the perfect time to take inspiration from this maternal period in my life to focus on the ‘wee ones’ whose care I am partly responsible for in my professional life. 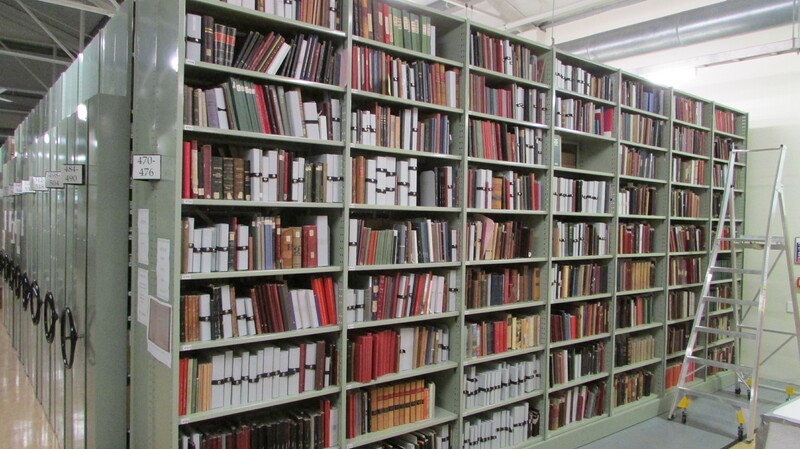 Those ‘littlies’ in the archives that may be small, but are also perfectly formed. Our “octavo” sequence of archives is broad in range, and runs to a full 90 linear metres in length. 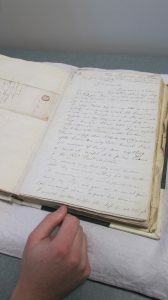 It includes personal volumes such as diaries, reminiscences, letter books, notebooks and bibles, as well as records of organisations such as minute books and ledgers. 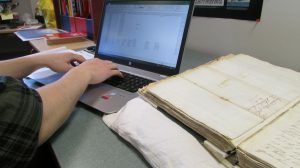 Many of the volumes are in a very fragile state and have preservation copies so that researchers can have access to them, without further harming the original. Octavo is a book binding term that refers to small volumes which were originally made by folding a full sheet of paper three times to make eight leaves, each leaf being 1/8 the size of the original sheet of paper. In practice such volumes are roughly 8-10 inches in height. However, our diminutive friends are not just to be found within the octavo sequence alone – they will often be found dotted throughout the collections in various guises, from the tiny appointment books of poet, editor and Hocken benefactor Charles Brasch through to the miniature soldier’s diaries that have miraculously survived through rough war conditions. This blog takes a look into just a few of the more significant of these babies, safely ‘swaddled’ within their phase boxes for maximum care and protection. 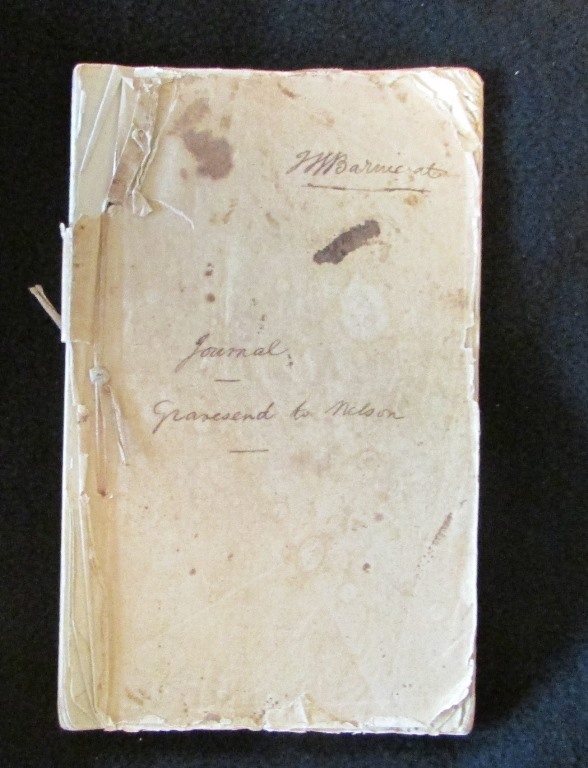 Diary of surveyor John Wallis Barnicoat, kept during a voyage from England to New Zealand in the ‘Lord Auckland’, 1841-1842. Misc-MS-1451/001. 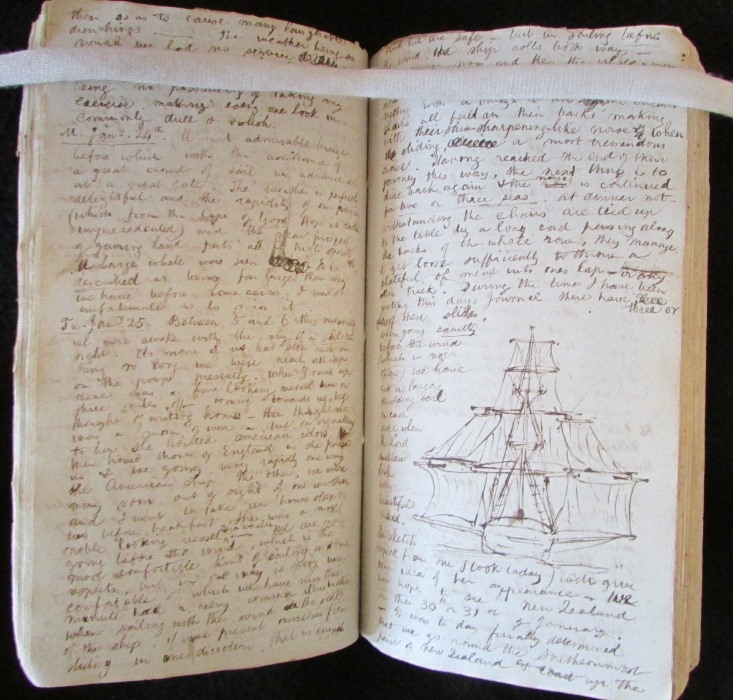 The diary includes pen illustrations of the ‘Lord Auckland’, detailed life aboard ship and diagrams of the ship’s accommodation and deck layout. Misc-MS-1451/001. In March 1844 Barnicoat was employed to assist Frederick Tuckett in selecting a site for the future Otago settlement. This beautifully sketched map shows ‘The route from Molineux [sic] to Otago’. Misc-MS-1451/003. 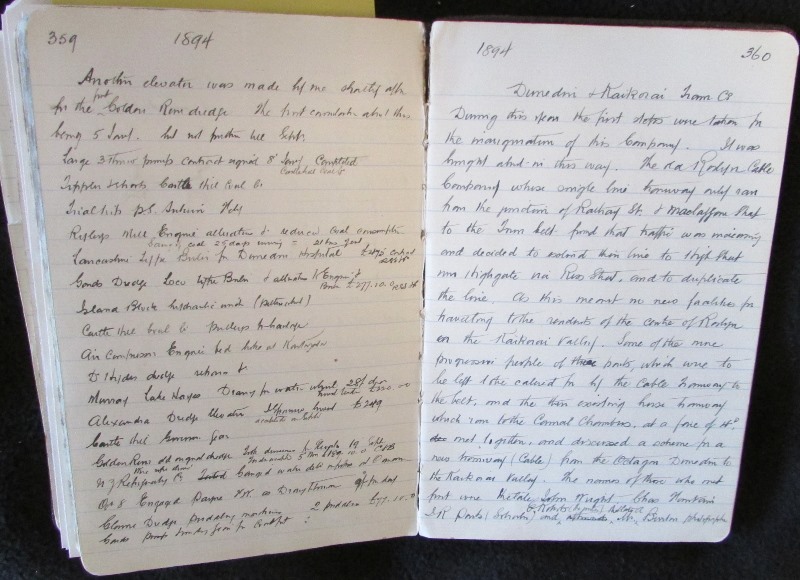 The corresponding diary entries (written in pencil on the sketch page and partly transcribed below) relate to the purchasing of the Otago Block. 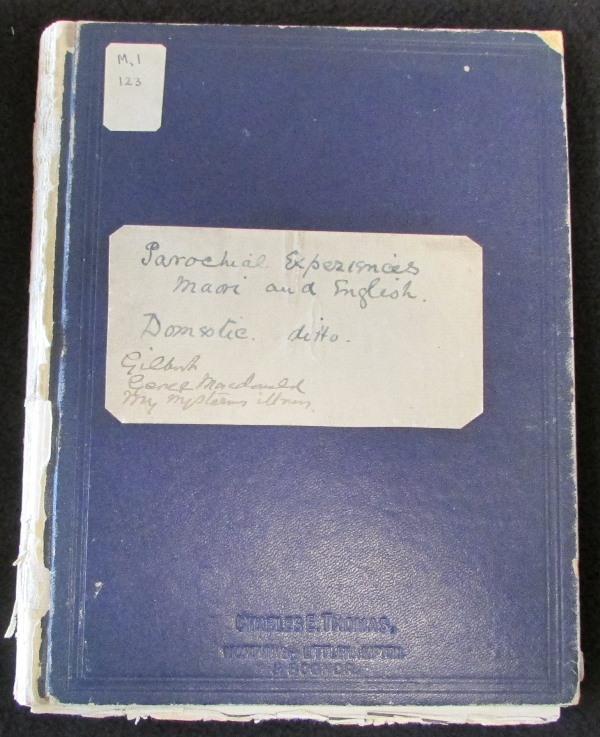 This volume of handwritten notes on New Zealand and Otago history and people, is part of the original ‘nucleus’ collection of Dr Hocken, and is dated around 1892. MS-0037. 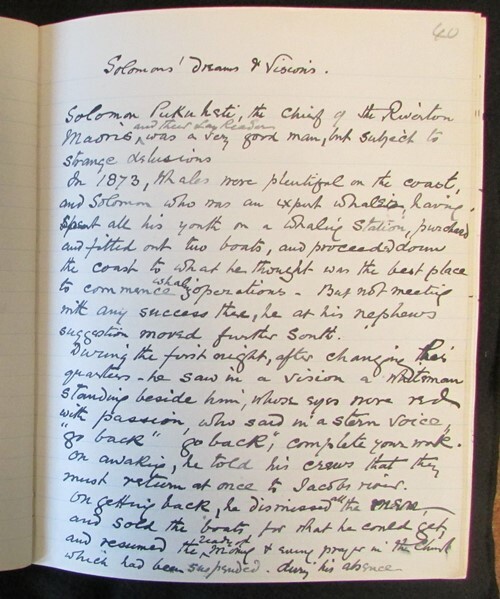 One of Dr Hocken’s entries on the origin of Rongowhakaata leader, military leader and prophet Te Kooti’s name – a transliteration of Coates, the name he received in baptism. MS-0037. 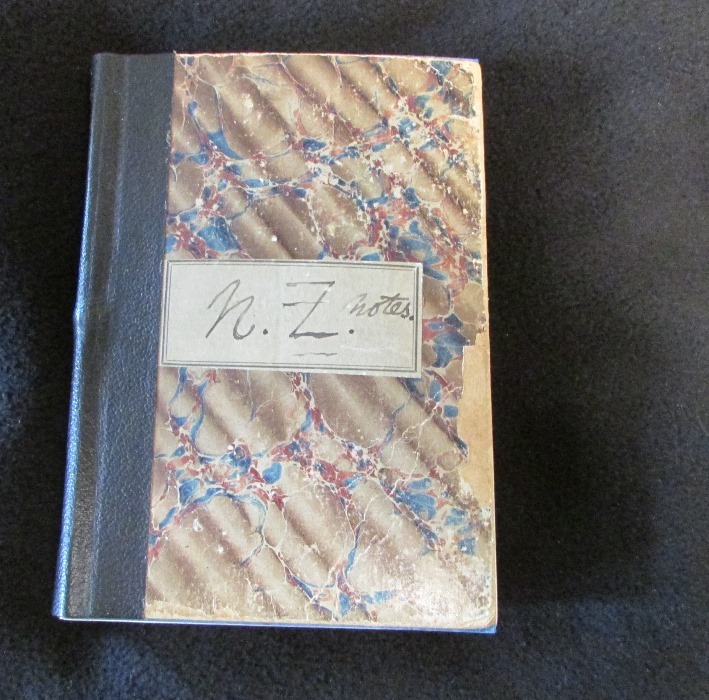 MS-0484/001.First volume of reminiscences, began in 1916, of Civil and Mechanical Engineer Edward Roberts (1851-1925). It spans his upbringing on the Bendigo Goldfields of Victoria, his arrival in Dunedin in 1881 and engineering career. There are some excellent ink sketches and an interesting account of the Dunedin and Kaikorai Tram Company in 1894. MS-0484/001. I will finish with this interestingly titled volume from Rev. James West Stack (1835-1919), the oldest son of missionary James Stack. It consists of handwritten anecdotes and reminiscences drawn from a period of more than forty years, many relating to Stack’s experiences among Maori. MS-0123. 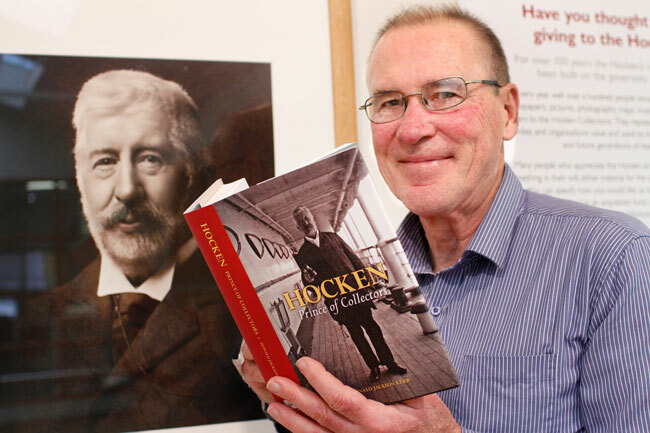 The Hocken Collections was delighted to host the launch of Dr Donald Jackson Kerr’s latest book, Hocken : Prince of Collectors last night. Donald is of course a colleague of ours and frequent Hocken visitor. 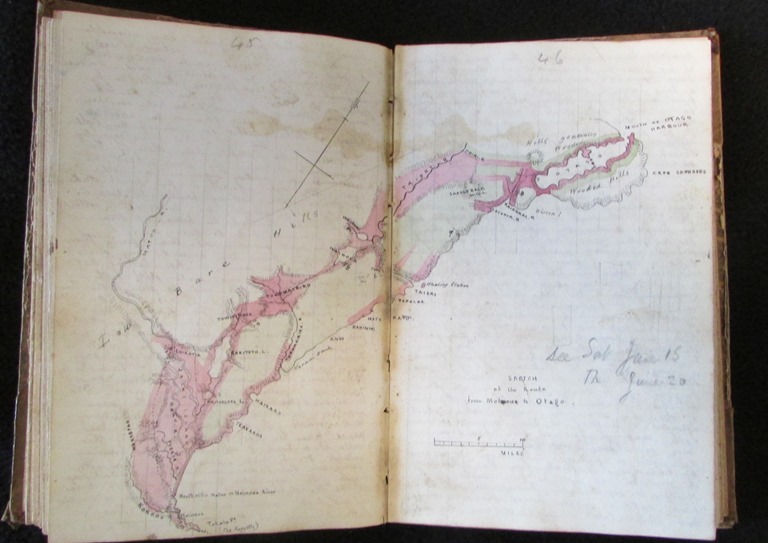 We have followed progress on this project with great interest as Donald has spent many, many hours both here and at other institutions researching Dr Hocken’s collecting activities. Our heartiest congratulations to Donald on the publication of a wonderful book which adds substantially to our understanding of Dr Hocken and his collections. For more information on the book see this article in the Otago Bulletin. 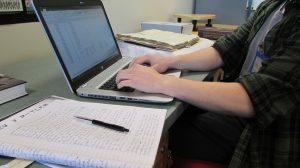 Going for UNESCO Gold – A second Memory of the World Registration for The Hocken Collections! We are very excited to announce that the Hocken Collections has again been successful receiving a Memory of World Registration. 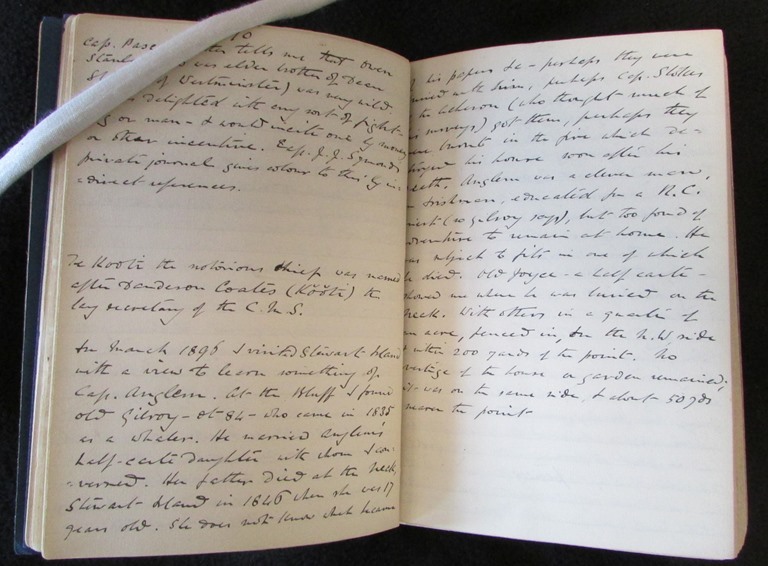 This year it is Dr Thomas Morland Hocken’s collection of Church Missionary Society papers that has been added to the register. We made application this year as part of our programme of work to commemorate 200 years since the mission at Rangihoua in the Bay of Islands was established. 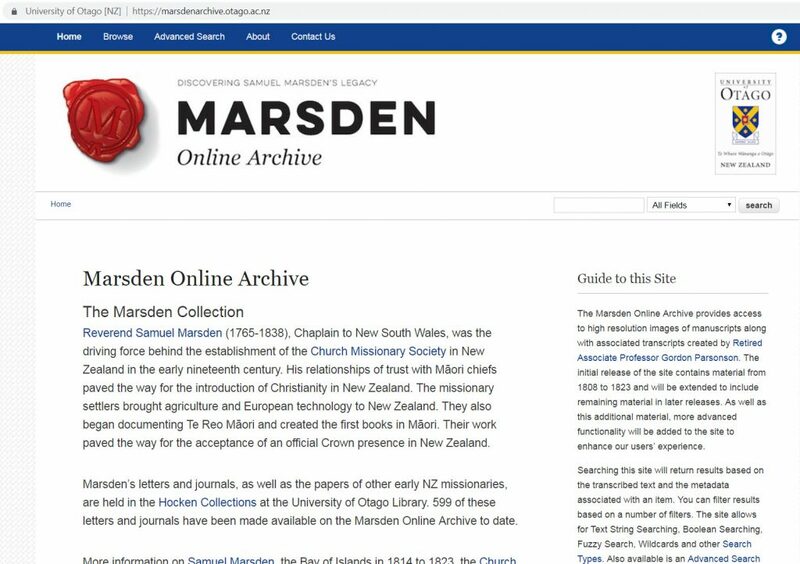 Our current exhibition Whakapono : Faith and foundations showcases some of the documents in the collection, and the Marsden online website provides sophisticated tools to search a portion of the documents. This collection of records acquired by Hocken from the Church Missionary Society in London contains the letters and journals of Rev Samuel Marsden and the settlers who came to New Zealand in 1814 to begin establishing missionary settlements. 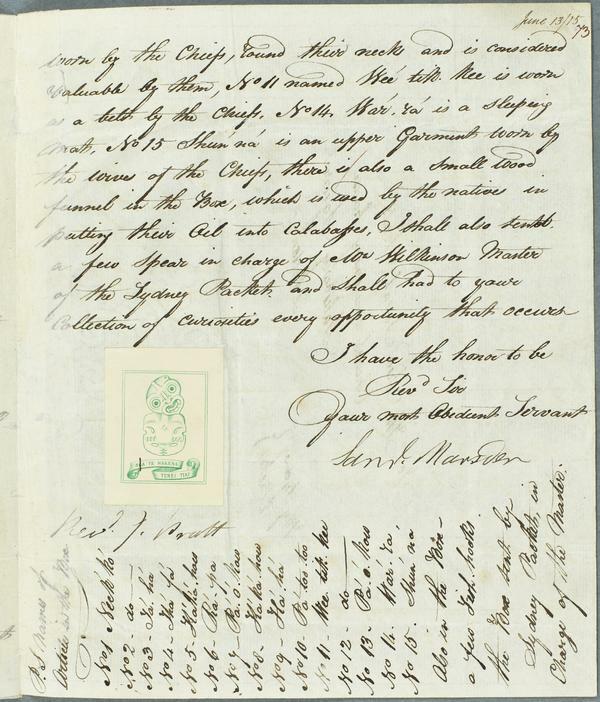 The records document the development of the Anglican mission in the Bay of Islands including Marsden’s celebrations of Christmas Day 1814. In describing what they saw and learnt in detail the authors created a rich resource for developing our understanding of New Zealand in the pre-Treaty of Waitangi era. They provide a first-hand account of Maori world around the Bay of Islands; describing people, places, events, conversations, battles and gatherings, who was important and why, relationships between local iwi and hapu, Maori cultural practices, rituals, religion and arts, Maori horticulture, fishing and foods, and the land and sea, forests and lakes. The writers also describe their work introducing European agriculture, new plants and animals, teaching reading and writing, how they learnt Te Reo Maori, the development of early Maori orthography and also their own tiny community’s internal strife, failures and successes as they struggled to live together in a foreign and isolated place. 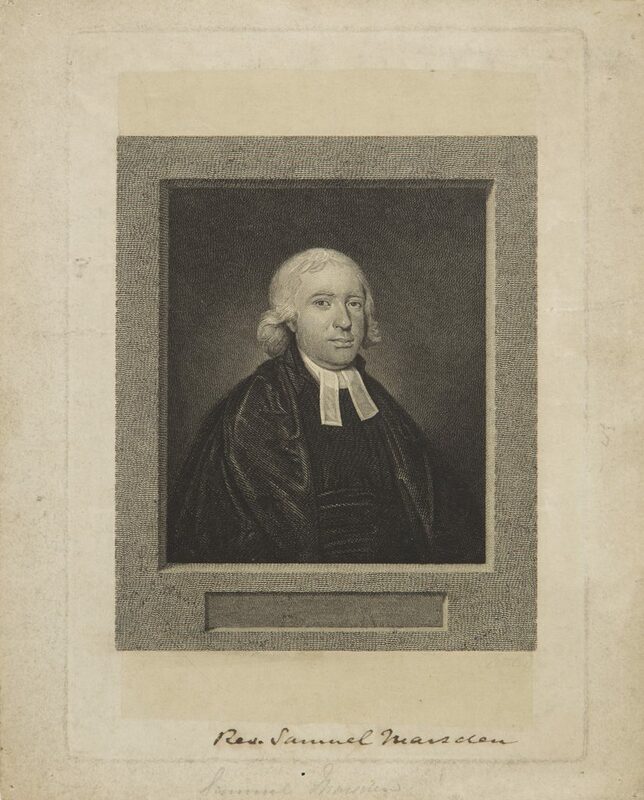 The documents are written by a variety of people principally Samuel Marsden, Thomas Kendall, William Hall, John King, John Butler, Reverend Henry Williams, James Kemp, Richard Davis, George Clarke, James Hamlin, William Colenso and the CMS officials in London. From the early 1800s Maori were beginning to explore the wider European world. They were intensely curious about European technologies, literacy, religion and trade. Seeing the potential benefits these could bring to their people Nga Puhi leaders Te Pahi, Ruatara and Hongi Hika used their relationship with Samuel Marsden to encourage him to send teachers, agriculturalists and artisans to New Zealand. The records registered are MS-0053, MS-0054, MS-0055, MS-0056, MS-0057, MS-0058, MS-0060, MS-0061, MS-0062, MS-0063, MS-0064, MS-0065, MS-0066, MS-0067, MS-0068, MS-0069, MS-0070, MS-0071, MS-0072, MS-0073, MS-0176/001, MS-0176/002, MS-0176/003, MS-0176/004, MS-0176/005, MS-0177/001, MS-0177/002, MS-0177/003, MS-0177/004, MS-0498. Hocken was an active collector of publications and archival material documenting New Zealand’s history and culture. He was particularly interested in the early mission period. 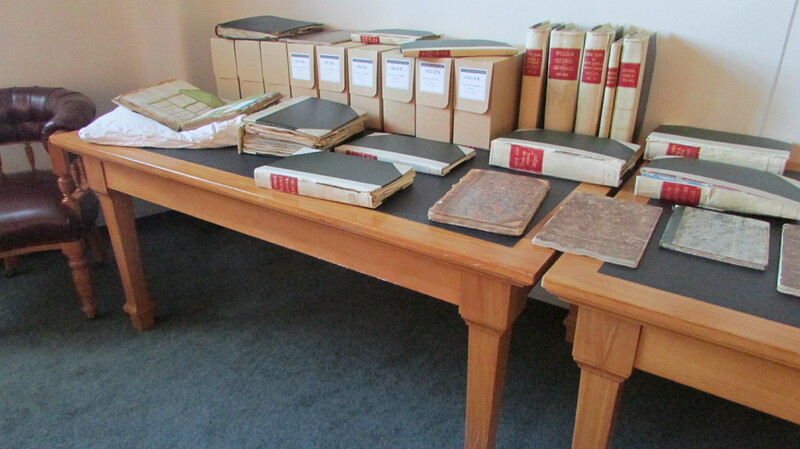 These records were primarily acquired by Dr Hocken directly from the Church Missionary Society in London in late 1903. Whilst initially reluctant to part with the records the CMS eventually agreed that they should be returned to New Zealand. Hocken later sent £250 to the Society. Hocken also acquired some of the documents in the collection from descendants of the missionaries. Dr Hocken’s collection was transferred to the University of Otago in 1907 under a Deed of Trust that established the Hocken Collections. Further additions of complementary Church Missionary Society records have been made by donation and purchase, notably the purchase from D.K. Webster of London in 1967 of the papers comprising MS-0498.